Sometimes what’s visible on the surface of the water is only the tip of the iceberg, and sometimes you’ve got to look beneath the surface to see true results—as is the case with a chemical peel. This modern-day fountain of youth is surpassing the serums, BB creams, and Argon oils that consumers are putting on their face on their quest for better skin in a short amount of time. Odds are that you’ve tried all these creams and oils before and when that hasn’t worked, you moved on to facials or dermabrasion techniques. Still not working? Whether you’re recovering from years of acne and sun-damaged skin or simply in search of that healthy glow, we all want our skin to be kept in tip-top shape and we all want something to help us achieve this goal. The chemical peel is a game-changer in advanced skin care as it clears away the damaged top layers of skin through a rigorous chemical cleansing process, revealing the undamaged and new layers of skin beneath. Even better, there are different types of chemical peels to suit different types of skin needs. A trichloracetic peel is used for those looking for a medium to deep peel while glycolic acid works best for clearing wrinkles and smoothing skin. Glycolic acid along with salicylic acid are superb peel options for patients struggling with acne or skin sensitivity. Be sure to pick your skincare professional Only go to licensed spas and reputable professionals. Listen to your skincare professional’s advice when recommending what chemical peel is best suited for your skin. This normally depends on your skin type. Wear sun cream daily and cleanse and moisturize twice daily before your peel. This will help prepare your skin and help achieve the best results. Use soothing products and antioxidants on your skin following the peel. Ask your skincare professional what products are best to use. Exfoliate in the weeks leading up to your peel. Have a medium or deep peel if you are suffering from acne. Instead, discuss a superficial peel with your skincare professional (such as a hydroquinone and resorcinol exfoliating treatment). Relax your skincare routine once your peel is over. 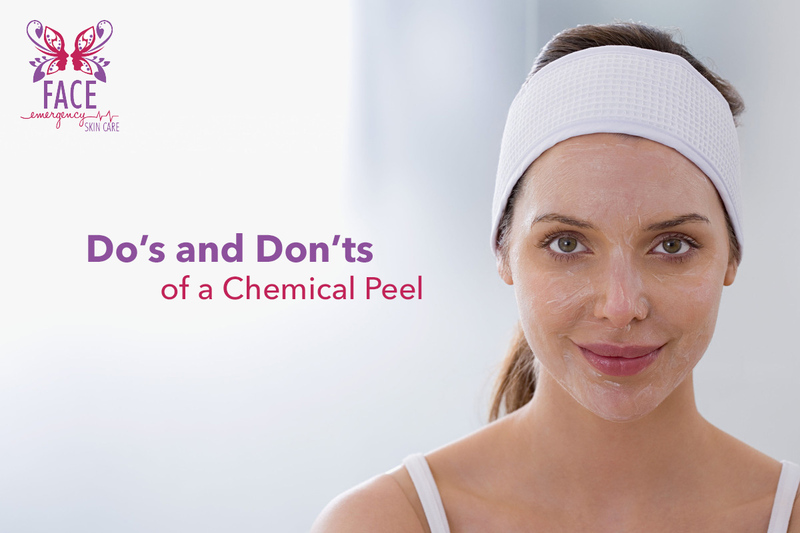 Proper cleansing following your peel is just as important before. Go into the sun following your peel. Your skin will be vulnerable to UV rays. Forget to follow up with your skincare professional after your peel. Your recovery time following your chemical peel will depend on the depth of the peel you’re having. A medium-to-deep peel may see you enjoying some well-deserved downtime for a few days, while a light peel can have you out and about that very evening. Be sure to speak to your skincare professional about what recovery time is needed for your particular peel and skin type. At Face Emergency Skin Care we offer a variety of chemical peels to suit a wide range of clients around Chattanooga. Contact us today to start your skincare journey.